Forms of birds and hands frequently appear in this pattern of lines. 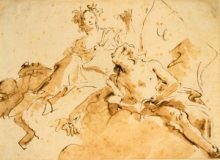 Developed in France in the 1760s, aquatint is a specialised etching process that yields tonal variations. This is achieved by etching a fine texture into the plate at varying depths. The deeper the etched mark, the darker the tonal value. The original goal was to mimic watercolour or ink washes. 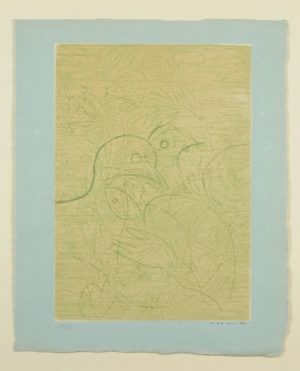 Ernst, however, uses aquatint here to play with the strength and depth of similarly coloured strokes. 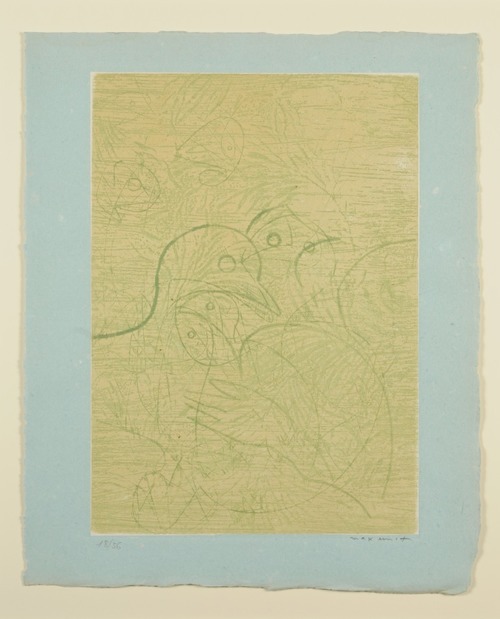 He layers outlines of birds, hands and leaves in the style of Surrealism, which prized the irrational and the unconscious over order and reason. The effect is also reminiscent of collage, which Ernst used throughout his career as a key member of Dada and Surrealism to address shocks of societal upheaval.